Tron: Legacy is a very belated sequel to the 1982 science fiction classic Tron, which starred Jeff Bridges and Bruce Boxleitner and introduced audiences to what were then state-of-the-art computer graphics in a story about a computer programmer named Flynn who gets sucked into his own software programme and is forced to take part in vicious gladiatorial games by the omnipotent Master Control Program. The sequel, which is directed by Joseph Kosinski, sees Flynn’s son Sam (Garrett Hedlund) suffer the same fate as his father, albeit 20 years later, when he receives a mysterious message from his father’s old video game arcade and subsequently becomes trapped in the same digital world – which in the intervening years has become bigger, more visually stunning, and much more dangerous. With the help of a beautiful warrior named Quorra, Kevin must traverse this astonishing landscape and find a way home. The film, which stars Olivia Wilde and Michael Sheen and sees both Bridges and Boxleitner reprising their original roles, is Disney’s big movie for Christmas 2010, and features an original score by Daft Punk. For those unfamiliar with their history, Daft Punk is a French electronic music duo comprising composer-musicians Thomas Bangalter and Guy-Manuel de Homem-Christo. They first emerged as part of the French house music scene in the early 1990s and became hugely influential and successful, eventually going on to enjoy chart hits such as “Da Funk”, “Around the World” and “Harder Better Faster Stronger”. Their gimmick is that the pair of them wear stylized crash helmets and futuristic body suits on stage, giving them a sort of detached, other-worldly public persona a little like the Blue Man Group, or what Slipknot used to do in the hard rock scene. Bangalter has previous film music experience, having scored the extremely controversial French film Irréversible as a solo composer in 2002, but this is the first time Daft Punk, as a group, has scored a film. Following in the footsteps of Wendy Carlos, who scored the original Tron, Daft Punk have expanded their electronic palette to include a 90-piece symphony orchestra recorded in London. The resulting sound is immense. Many readers may be under the impression that I don’t like electronic scores, but I can categorically say that this is not the case. I like electronic scores when they have a reason to be electronic, not when synthesizers are simply used to double up or (even worse) imitate on an orchestra. 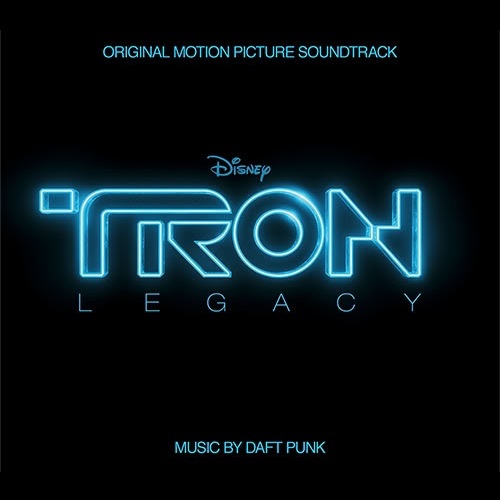 With its overarching themes of the human world being invaded and overtaken by its digital counterpart, Tron: Legacy has a reason to be electronic, and Daft Punk’s skilful merging of the two musical palettes is one of the most engaging things about this excellent score. In terms of the stylistics of the electronic music, there’s a little bit of John Carpenter, a little bit of Brad Fiedel, a little bit of Vangelis, and (obviously) a little bit of Wendy Carlos, all mashed together and filtered through Daft Punk’s high energy rhythmic sensibility, but with a larger scope and a greater lyricism than any of these other pioneering electronic composers brought to their scores. There are no direct statements of any of Carlos’s thematic work on the original Tron, but her fingerprints are everywhere, and I have to say that this is some of the best synth writing I have heard in a film score in years. It becomes even better when it mixes with the large-scale symphonic forces provided by the London orchestra, which humanizes and warms the electronic tones, giving them an emotional center and a great deal of power and gravitas. Many will inevitably compare this music to that of Hans Zimmer, especially his recent score for Inception (listen to “Recognizer”), but while the orchestral tones are similar in their chord progressions and rhythmic ideas, the electronics have a sophistication way beyond anything anyone from Remote Control has shown to date. The multiplicity of tones, sample types, and nostalgic throwbacks to the synth sounds of the 1980s give the electronic parts of Tron: Legacy a depth and variety almost never heard in scores of this type. Whereas Zimmer and company often limit the scope of their electronic palette, Daft Punk opens theirs up to encompass a massive range. The opening “Overture” introduces the main theme of the film, a heroic piece which has a vague similarity to Aaron Copland’s classic piece Fanfare for the Common Man. “The Grid” features some stirring and dramatic narration by Jeff Bridges (the only cue to do so), which builds to an alien-sounding but wonderfully effective statement of the main theme. In the score’s conclusive cues – “C.L.U”, “Flynn Lives” and the “Finale” – the theme reaches appropriately epic proportions, while in the “End Titles” cue the theme is accompanied by a modern, driving, defiantly upbeat electronic accompaniment which is simply terrific. There is even room for a conventionally attractive classical love theme, “Adagio for Tron”, which features an absolutely gorgeous cello solo, before going on to pick up a bubbling electronic undercurrent during its second half. The action music is busy and powerful, with thunderous cues like “Rinzler”, “The Game Has Changed”, “Fall” and “Disc Wars” building layer upon layer of propulsive electronic sound design and booming percussion hits over a bed of churning, endlessly moving string lines. “Outlands” has a terrific Don Davis-style fading brass effect towards the end of the cue, while “Rectifier” has portentous horn blasts and an ominous, I’m-coming-to-get-you string figure which sounds more like something Elliot Goldenthal would write, and has a wonderful, palpable sense of danger. The moments of pure electronica – “The Son of Flynn”, “Armory”, the Terminator-like “Arena”, the groovy “End of Line”, the aggressive and highly-charged “Derezzed”, the unexpectedly graceful “Solar Sailer” – are fascinating, and often have a mesmerizing dream-like ambience which is astonishingly effective. Some of these cues have the same hypnotic, euphoric aura that 1990s trance music had, which makes perfect sense considering Bangalter and Homem-Christo’s respective backgrounds. Knowing me and my tastes, Tron: Legacy is the last score you would expect me to praise, but there’s something about Daft Punk’s music here which is immensely engaging and interesting. Maybe it’s the sense of freedom and lack of cynicism that composers new to film music always seem to have, being let loose in an exciting new world. Maybe it’s their total commitment to the project, and their obvious thrill at being able to incorporate an orchestra into their music for the first time which makes things so appealing. Their electronic sound design is so fresh and lively when compared to the tired old samples we have grown accustomed to hearing over the last few years. And while their orchestral writing is certainly not groundbreaking in any way, it has a pleasing tonality and an appropriately grand scale which makes it very easy to enjoy. It’s unlikely to win any awards, but in this case it really doesn’t matter: this is one of my favorite scores of the year, and I’m as surprised to be typing that line as I’m sure you are to be reading it. Music composed by Thomas Bangalter and Guy-Manuel de Homem-Christo. Conducted by Gavin Greenaway. Orchestrations by Joseph Trapanese and Toby Chu. Orchestration consultant Bruce Broughton. Recorded and mixed by Alan Meyerson and Geoff Foster. Edited by Sally Boldt. Album produced by Thomas Bangalter and Guy-Manuel de Homem-Christo. I couldn’t wait to hear this so when i stumbled on the leaked album I couldn’t help myself (I will buy the CD!). But I must say, I don’t agree with this review. The album’s highlights are still enjoyable, but these highlight tracks are almost all ripped off Zimmer or the people who have already ripped off Zimmer. However I think I was particularly bothered by the track Recognizer as it appears to be a complete rip off of Michael Mccann’s music for the Deus Ex 3 trailer (if you listen to it I think you’ll agree). Again it’s not a bad score, maybe even 3.5 stars from me, but I shudder when I think of all the great scores you’ve given 4.5 or 4 stars to that are therefore on par or worse than this in your opinion. I agree, I do sometimes over-star things when I’m enthusiastic about a score, but these things gradually temper over time. Even taking into account historical perspective, this is still a strong ***½ or **** work. I absolutelyy agree on this review. This score is great, much better than I expected. It’s a perfect mix between electronic and orchestral music. It will be among my top 10 scores (maybe even top 5) scores of 2010. “Many will inevitably compare this music to that of Hans Zimmer, especially his recent score for Inception”. Tron is exactly what Inception SHOULD’ve sounded like. Dark, broody, agressive, hi engergy… and still transparent, rather than just a impenetrable wall of sound. You’re right about the Cherry 2000 influences, I hadn’t spotted that before. There’s a lot of classic film music electronics in this score, Terminator and whatnot, but the way it’s arranged just seems to invigorating. I love it. Wow, this review got me even more amped to hear the score. I was looking forward to what Daft Punk could come up with for this movie and it sounds like the nailed it. I’m a bit disappointed they didn’t use any of Carlos’ themes but I’m not too surprised either. I’m probably going to wait to pick this up till after I see the movie, but I’m looking forward to it. I have question about the packaging, does the UK release come in a jewel case or in a digipack form? And what is the catalog number? Agreed with the review, this is one of the best soundtracks of the year by far. Tracks like “Recognizer” and “Adagio for TRON” are almost worth the price alone. The album is full of highlights, and actually it’s a rewarding listening experience from start to finish. It’s atmospheric, it’s emotional, it’s epic, it’s a reminder why some of us started listening to soundtracks in the first place. The only bad thing is this well known (and infuriating) marketing strategy with the “online exclusives”. One of the best bonus tracks like “Outlands Part 2” is an online exclusive, and it’s not as if there wasn’t any room in the second disc of the limited edition release. I’m glad the more “traditional” score reviewers showed this album the appreciation it deserved and were not put off by the electronic elements, this is one of the albums that show how great an orchestra and electronics can work together, and it has already become one of my favorites alongside works of Craig Armstrong. P.S. Indeed, there are certain parts that sound a lot like Hans Zimmer’s work for Nolan’s Batman. I have to say something… I have never liked electronic music, but this soundtrack changed my mind, and I even believe good electronic music is beautiful.